The following case was recently highlighted on the Pennsylvania Defense Institute website (http://www.padefense.org/). 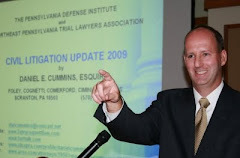 More details on these cases, as provided by Matt Keris, Esquire from the Moosic, PA office of Marshall, Dennehey, Warner, Colemen and Goggin, can be reviewed by visiting that website and clicking on "Case Summaries." The Plaintiff in Bowman raised a negligence claim for injuries she sustained while working as a private security guard on Sunoco property. As a term of her employment, she signed a third party release pertaining to any and all claims she may have against any customer of her employer. In a case of first impression, the Superior Court ruled that there was no public policy violation in enforcing the release because the release did not affect the employee's workers' compensation rights. In other words, the court ruled that there was "nothing unconscionable about releasing claims against customers for injuries [sustained by the employee] that are already covered by workers' compensation law." Plaintiff's claims were therefore dismissed.